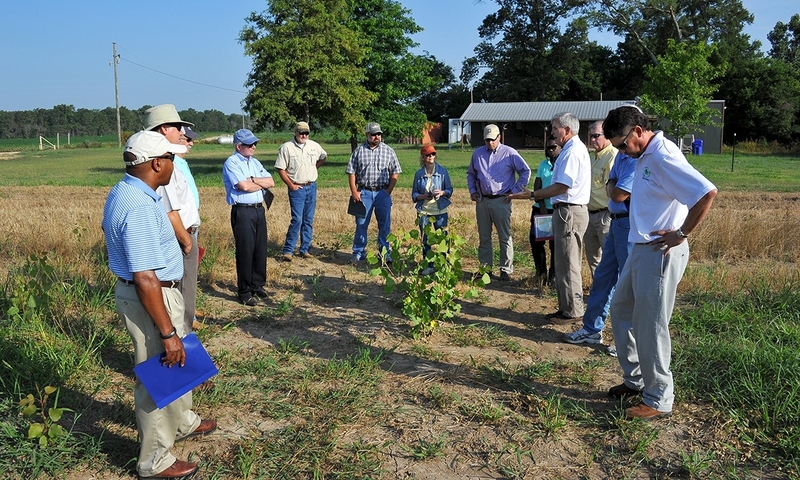 CEO Wick Moorman, fourth from left, and an NS delegation traveled to Mississippi in the summer to visit properties that are part of the company’s Trees and Trains partnership with GreenTrees. Other NS representatives pictured are Blair Wimbush, at far left, Josh Raglin, next to Wimbush, Deb Butler, in middle of photo, and Esi Waters, fifth from right. Speaking at right next to Waters is Don Anderson, a forestry manager with GreenTrees. This young cottonwood will grow to provide shade and shelter to slower-growing hardwoods and can be harvested for timber when mature. 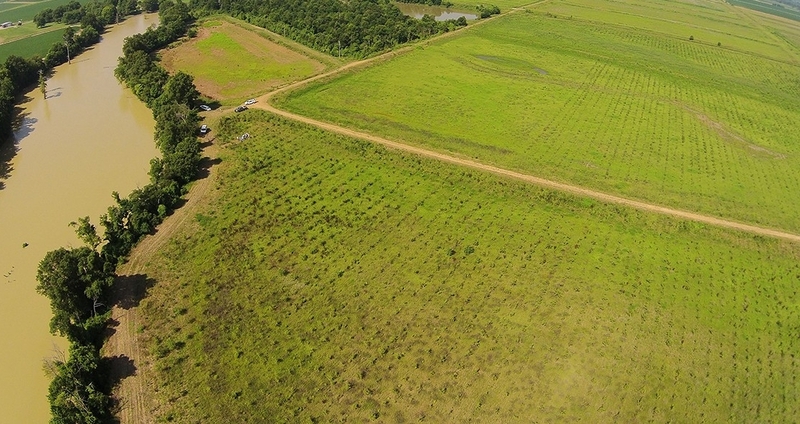 An aerial view of an NS Trees and Trains planting site in Mississippi. NS’ $5.6 million investment in the GreenTrees partnership will reforest 10,000 acres in the Mississippi Alluvial Valley. Blair Wimbush, vice president real estate and corporate sustainability officer, talks with Don Anderson, a GreenTrees forestry manager, about the ecological and economic value of cottonwood trees, which are native to the Delta. 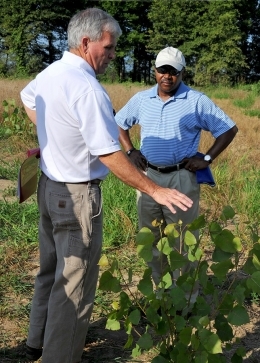 Three years after launching Norfolk Southern’s Trees and Trains initiative to reforest 10,000 acres in the Mississippi Delta, CEO Wick Moorman wanted to see firsthand the impact of the railroad’s $5.6 million investment. These properties are part of former woodlands spanning four states in the Mississippi Alluvial Valley that NS is helping to reforest through a partnership with GreenTrees, the country’s top reforestation and carbon capture program. This winter, GreenTrees will begin its fourth planting season as part of a five-year collaboration with NS to restore 6.04 million native cottonwood and hardwood trees in an ecologically important region the railroad has long served. To date, nearly 70 percent of NS’ trees have been planted. Most, if not all, of the remainder are expected to go in the ground during the 2014-15 planting season – a year ahead of schedule. NS will evaluate whether to make additional investments as GreenTrees secures property rights from additional landowners. Over a 15-year cycle, the trees NS is planting are expected to generate 1.1 million tons of carbon credits. For comparison, NS now generates roughly 5 million metric tons of carbon dioxide emissions annually, mostly from diesel-burning locomotives. To recoup its GreenTrees investment, NS can sell the carbon credits in the voluntary U.S. carbon-offset market. The credits are verified and registered by the nonprofit American Carbon Registry, and the first 10,000 tons of carbon credits from Trees and Trains were transferred into NS’ account earlier this year. Moorman traveled to Mississippi with Deb Butler, executive president planning and chief information officer, Blair Wimbush, vice president real estate and corporate sustainability officer, Josh Raglin, general manager facilities, and Esi Waters, manager corporate sustainability. While there, they met with Carey Crane, GreenTrees founding partner, and Chandler Van Voorhis, the company’s managing partner. “We wanted to get a representative sense of what the growth pattern is over a period of years,” Wimbush said, noting that fast growing cottonwoods act as “nurse trees” for the slower growing hardwoods by shading and sheltering them as they get established. The trees were in various stages of growth, ranging from 2 to 26 months. The 2-month-old cottonwoods were waist high, while the more durable hardwoods were a foot to 18 inches tall. 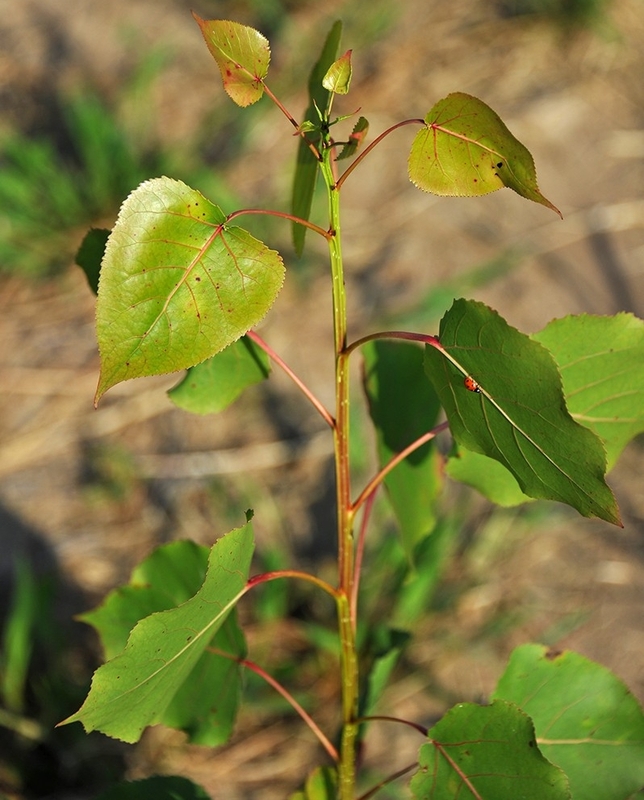 The 26-month-old cottonwoods had reached 8 to 9 feet tall, while the hardwoods were between knee and waist high. The NS group also met with members of wildlife organizations, including specialists in bears and migratory neotropical birds. Wildlife numbers declined as forests throughout the Delta region were cleared for agriculture, but as the forests are restored, birds, deer, bears, and other animals are expected to return. 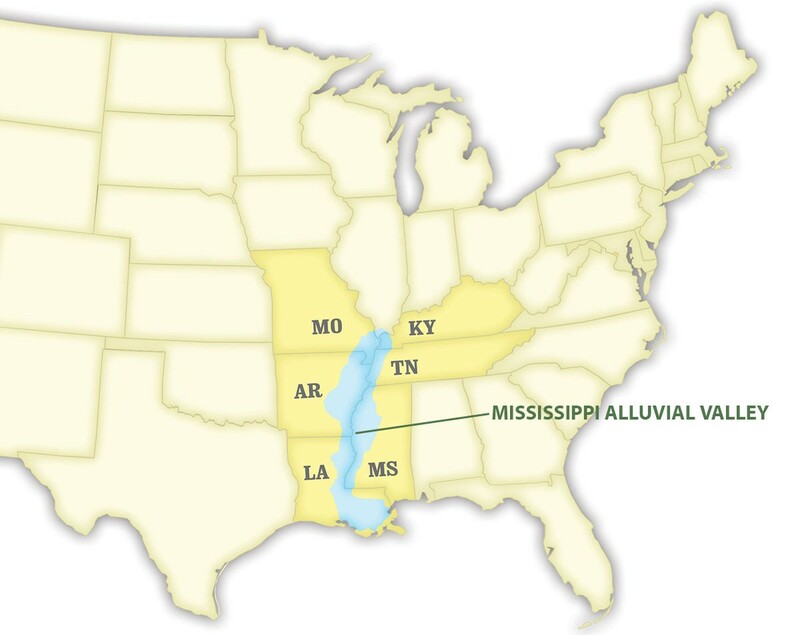 GreenTrees’ goal is to reforest 1 million acres in the Mississippi Alluvial Valley, the United States’ largest watershed and known as North America’s Amazon. Only about 4 million acres of the Delta’s original 25 million acres of woodlands remain, with the rest converted to development and agricultural production. Much of the farmland is now either underused or marginally productive. NS is GreenTrees’ largest corporate partner. In addition to environmental benefits, NS’ Trees and Trains project provides economic benefits to landowners who can leverage tax credits, conservation grants, and lease payments when they commit their property to GreenTrees. Support from NS and other corporate partners gives GreenTrees added traction in the community, Wimbush said. Landowners can generate additional income by harvesting and selling some of the cottonwoods for lumber at 10, 15, and 25 years, a thinning process that creates additional light and space for the hardwoods’ long-term health. In short, Trees and Trains represents for NS an ideal combination of conservation and capitalism, he said. GreenTrees developed the Advanced Carbon Restructured Ecosystem program to measure the economic benefits associated with the conservation of an acre of land. Using U.S. Forest Service calculations of the ecological value of a single tree, GreenTrees estimates that the NS trees will generate almost $1 trillion in benefits over 50 years, including monetary values assigned to the trees’ abilities to release oxygen, absorb CO2, reduce soil erosion, and recycle water. As NS’ initial commitment with GreenTrees winds down over the next two years, the railroad plans to evaluate future investments while seeking additional ways to enhance its sustainability profile. Through the Norfolk Southern Foundation, the company supports a variety of conservation projects, including those with The Nature Conservancy, the Elizabeth River Project, The American Chestnut Foundation, and The Longleaf Alliance, Inc. In addition, NS has developed substantial cachet among the environmental community through its conservation efforts of longleaf pines and endangered red-cockaded woodpeckers at the railroad’s Brosnan Forest corporate retreat near Charleston, S.C. In 2008, NS permanently protected most of the property from development through donation of a conservation easement to the Lowcountry Open Land Trust. Earlier this year, NS received about 225,000 carbon credits for its Brosnan Forest Improved Forest Management program. Proceeds from selling the credits could be used to further enhance management of wildlife and forestry resources at the Forest.